Japan’s economy watchers index, while improving, continues to hover below the neutral reading of 50 with a reading of 49.0 in April. As such, the index continues to indicate contraction. Despite the gain, the economy watchers April reading is lower on balance over three months as well as over six months, but it is higher by one half of one point over 12 months. The current index has a queue standing in its 63rd percentile. That is just a touch weaker than the queue standing for the future index which resides in its 64th percentile. However, the future index, which also rose in April, has climbed by the skin of its teeth past the neutral reading to log a diffusion value of 50.1. That is very thin gruel for good news. What we see from these diffusion values and standing calculations is that the current and future indexes are in a very similar situation. Both have readings in April of little change and both are just outside global standings in the top one third of their respective historic queues of data. Put together, these two readings paint a sluggish picture for Japan. The nearly two third ranking for both its current and future indexes corresponds to a situation in which neither is changing much at all. Japan’s breakeven point resides near the top one third of its queue of historic values. That simply underscores how weak Japan has been back to 2002. Fortunately, the situation for employment is better. 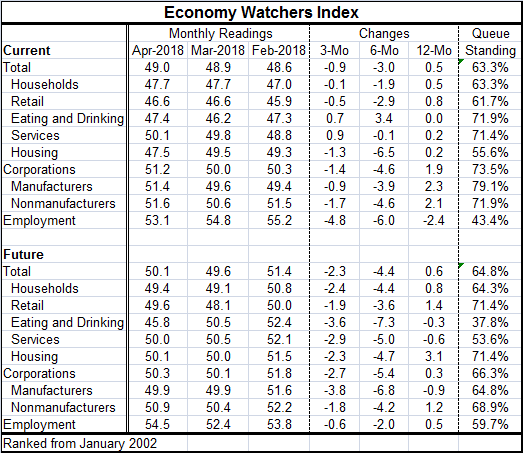 Current employment has a 53.1 diffusion reading in April showing that employment is rising. At that reading, the employment gauge is at the 43rd percentile of its historic queue of data- at that mark it is below its median- the median for all these calculations lies at the 50th percentile mark. So on a queue standing basis, employment is lagging behind the total and current indexes. And the employment reading is declining on all horizons. That is not encouraging. Households present a current standing in their 63rd percentile as does the headline. Corporations post a standing in their 73rd percentile with manufacturers in their 79th percentile. Housing and retailing are two sectors lagging the most in terms of their percentile standings. As for the future readings, of the 10 future readings in the table, only the reading for future employment is substantially above neutral (50). Four readings -- for households, retailing, eating & drinking places, and for manufacturers -- are below 50 indicating (expected) contraction. Five readings are contained in the 50th percentile slot itself, putting five more readings within one point (or less) of showing contraction. And the queue standings underline how weak conditions have been in Japan as with only two exceptions (really) the queue standings are at or above the 60th queue standing. The exceptions are eating & drinking places and services (employment is technically below 60 but it clearly rounds up to 60). Again this means that for most of these categories, breakeven is about at the two thirds mark in the queue standing of historic observations and that makes for a lot of weakness. On balance, Japan right now has little going for it. The Bank of Japan is still as stimulative as it can be. Mr. Abe is under pressure and could be forced to resign. Asia is a geopolitical soup of issues with North Korea a huge unknown and China showing more aggression and militarizing the islands it grabbed in the South China Sea- after promising that it would not do that. Japan has little momentum and right now is certainly hoping that a pick-up in global economic conditions will carry it higher since it has all but exhausted its domestic policy options.